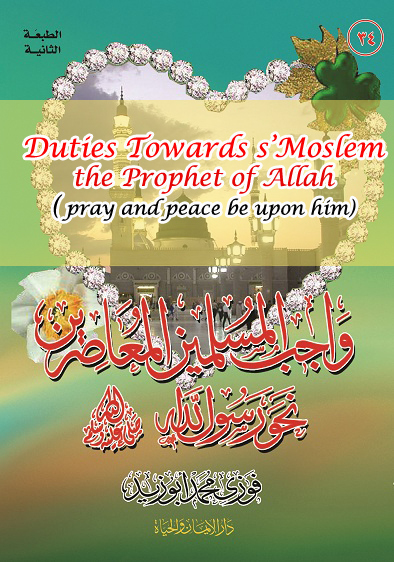 Praise be to Allah who beautified His darling prophet (Peace and grace be upon him) with highest morals and bright lights of faith and the best characteristics, Allah (Glory to Him) has made him with his body, his manners, his law and his advice to be a plea for Allah against all creatures. Peace and grace be upon the seal apostle by whom Allah honored the Islamic nation and made the prophet's fellows everywhere as messengers of guidance in this world, they collect hearts and attract people to Allah and they guided creatures to the oneness of Allah and worshipping him only. The bitter event that our Islamic nation has witnessed recently, I mean the event of the bad drawings abusing Prophet Mohammed (Peace and grace be upon him) that were published on some European newspapers, the reactions and situations they resulted in, although the guidance of the holy Quran, the prophet's Sunna and also the deeds of scholars in this matter are clear. We tackled this issue on some weekly lectures and speeches on Fridays, we also answered different questions of our friends in different places during our visits , some of our friends wanted to collect all this in a book to spread the Quranic and the prophetic way in this matter. Praise be to Allah, some true friends helped us doing it in this good form in hands. First, we mentioned the causes of these violent attacks we face and analyzed them one after the other and how they gathered together and led to what we are suffering now. After that we described the supply Muslims need to face these attacks and to rise from this trip that weakened us in the eyes of our enemies. We also mentioned the methods every Muslim need to call others to Islam. We finished with the nowadays Muslim's duty and how to use the Quranic respond to those who abused the prophet (Peace and grace be upon him) and what should a Muslim do for the prophet (Peace and grace be upon him). Finally, we wondered if there is a utility from what happened. O dear brothers and sisters: As I present this book to you, I beg Allah to reward those who contributed to achieve it and to make it for His sake, helps to remove misunderstanding and clarify the reality to make people recognize the beauty and integrity of this religion, so that the souls are eager to follow the guidance of prophet Mohammed (Peace and grace be upon him). To make these priceless facts available to all Muslims and nun Muslims who can't speak Arabic and who are in bad need for these facts, I ask and encourage every jealous and lover of the prophet (Peace and grace be upon him) from among people of languages, translators and publishers to translate this book and publish it in any other language and everywhere, this is my permission for translation and publishing for Allah's sake, loving to the prophet and contributing to make the call for Islam reach everywhere as possible as we can. Allah guides me, on Him I rely, to Him we will be back and peace and grace be upon our sir Mohammed, the best example for every repentant and the beloved for those who are doing the good or going back to it.